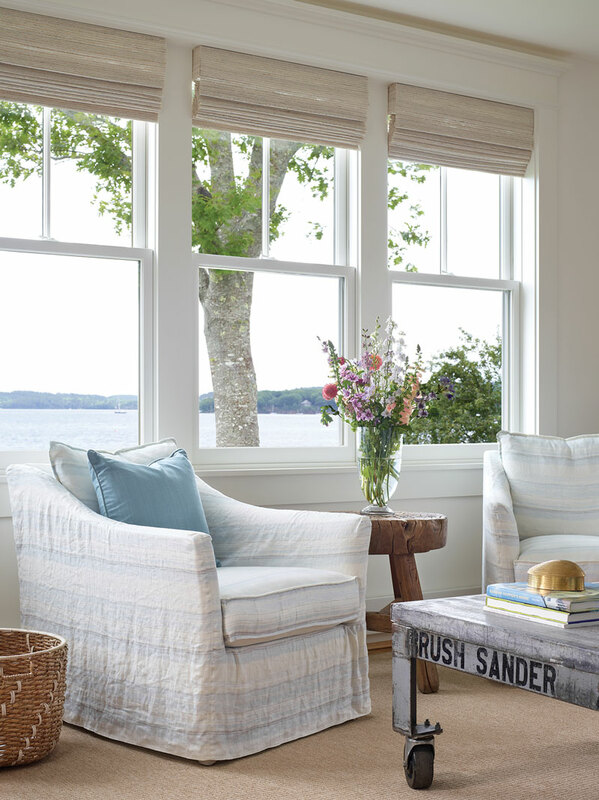 It was love at first sight for a Maryland couple and their cheerful Castine cottage. 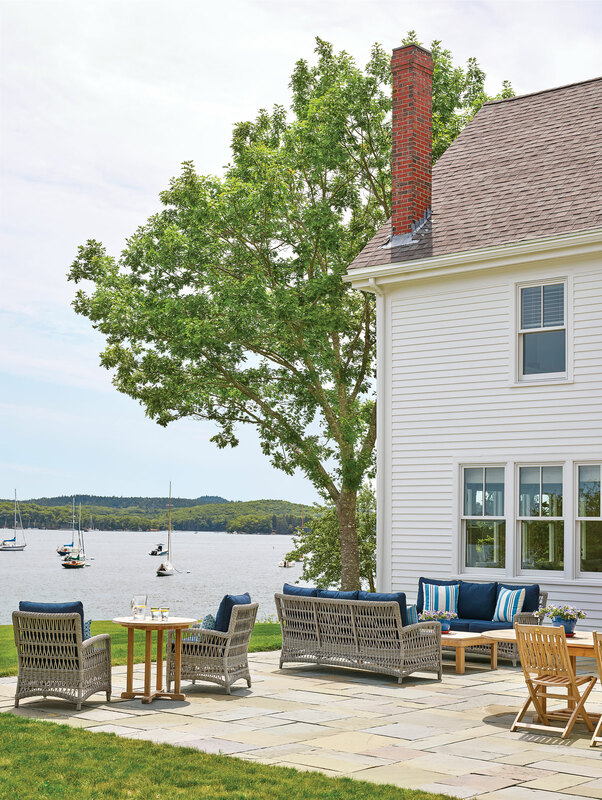 ABOVE Blue Hill’s Down East Landscape & Design built Loi Thai and Tom Troeschel’s flagstone terrace and graded the property toward the water, maximizing the view. 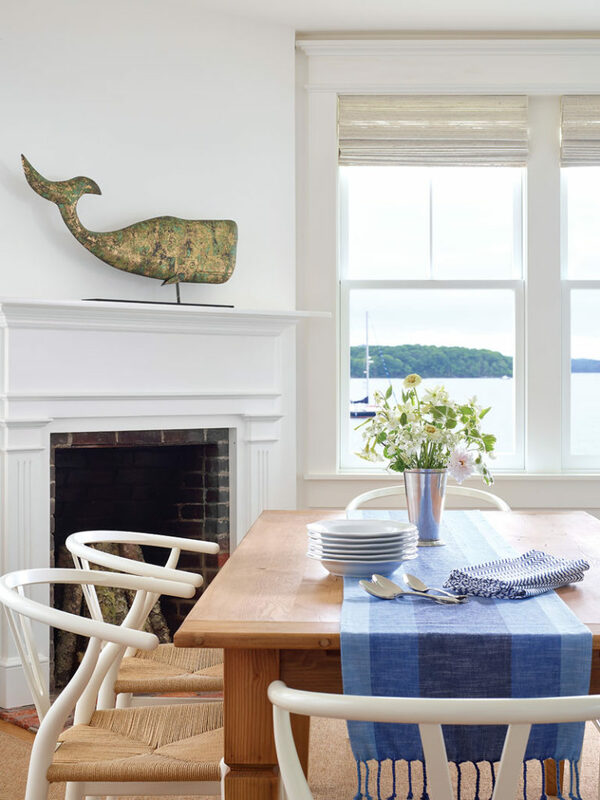 The wood furnishings are from Island Teak Company in Wiscasset. Thai found the dining room’s 19th-century weathervane at the annual Maine Antiques Festival in Union. The living room’s vintage dolly coffee table is from the Maryland antiques store he used to own, Tone on Tone. ABOVE LEFT Blue Hill’s Down East Landscape & Design built Loi Thai and Tom Troeschel’s flagstone terrace and graded the property toward the water, maximizing the view. 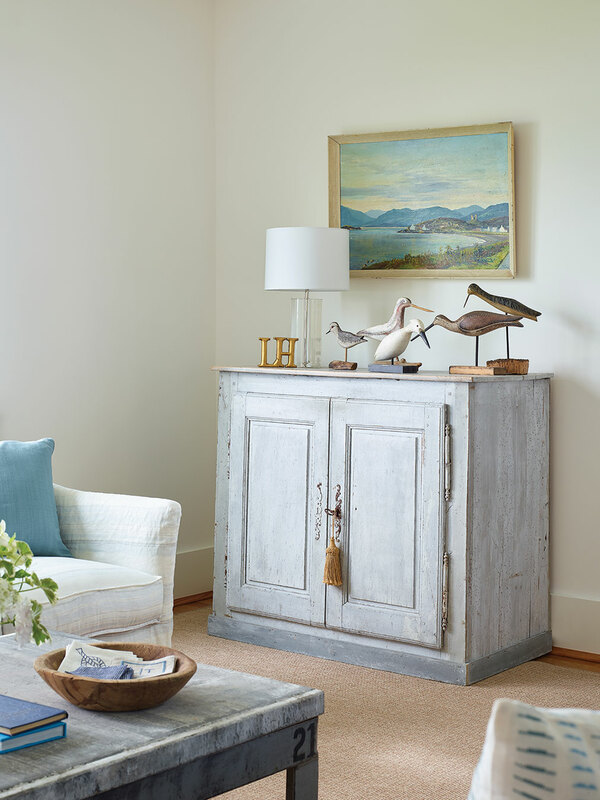 The wood furnishings are from Island Teak Company in Wiscasset. MIDDLE Thai found the dining room’s 19th-century weathervane at the annual Maine Antiques Festival in Union. RIGHT The living room’s vintage dolly coffee table is from the Maryland antiques store he used to own, Tone on Tone. The pair went on to buy and renovate a 4,000-square-foot, Federal-Victorian home with three stories and six fireplaces, elsewhere in town, but the little cottage stayed on their minds. So when it went on the market in 2015, they decided to make a move. ABOVE A slipcovered Crate & Barrel sofa and vintage wicker chair give the living room a casual air; the 1870s French faux-bamboo shelf holds 19th-century British mochaware. LEFT TO RIGHT Vintage decoys, from Searsport’s Pumpkin Patch Antiques and the Searsport Antique Mall, perch atop a vintage French cabinet from Tone on Tone. Rows of 19th-century American spongeware, compiled from sources such as the Maine Antiques Festival, enliven the kitchen. 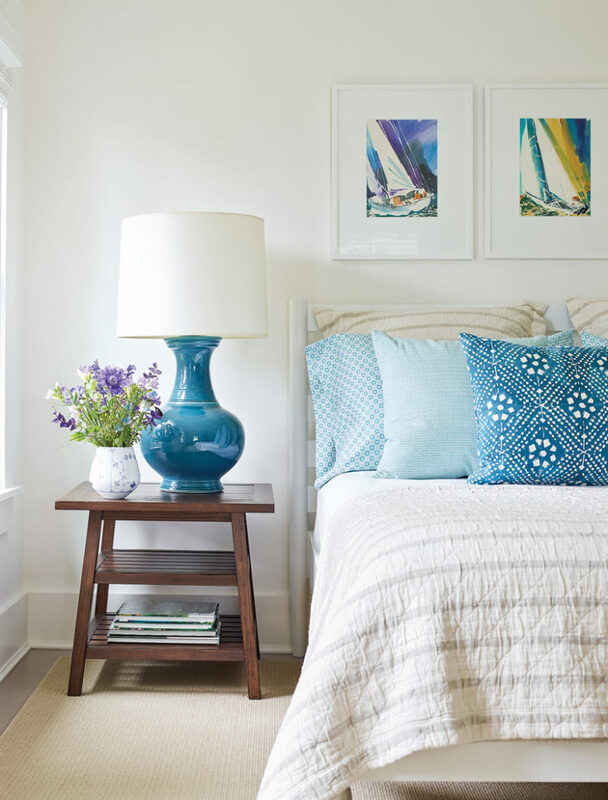 The nautical theme continues in the master bedroom, with its watercolors by British artist Dale Hart. For bouquets, Thai hits Dan’s Flower Farm at the Castine Farmers’ Market. ABOVE Vintage decoys, from Searsport’s Pumpkin Patch Antiques and the Searsport Antique Mall, perch atop a vintage French cabinet from Tone on Tone. Rows of 19th-century American spongeware, compiled from sources such as the Maine Antiques Festival, enliven the kitchen. The nautical theme continues in the master bedroom, with its watercolors by British artist Dale Hart. For bouquets, Thai hits Dan’s Flower Farm at the Castine Farmers’ Market. Fortunately, the two have professions that allow for remote work — Thai is an interior and garden designer with a formidable Instagram following (96,000 fans and counting) and Troeschel works for a nonprofit organization. 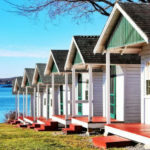 That flexibility was key when it came to renovating the cottage — a year-long endeavor that involved insulating, lifting and stabilizing the foundation, replacing badly settled and patched floors on the first floor, and updating the plumbing and electrical systems. “Everyone in town assumed we would tear down the house or add a huge addition,” Thai says, “but we love the old charm.” They saved as many original details as they could, including the pine floors upstairs, now painted warm gray, mahogany-railinged staircase, and elegantly pilastered dining room fireplace. 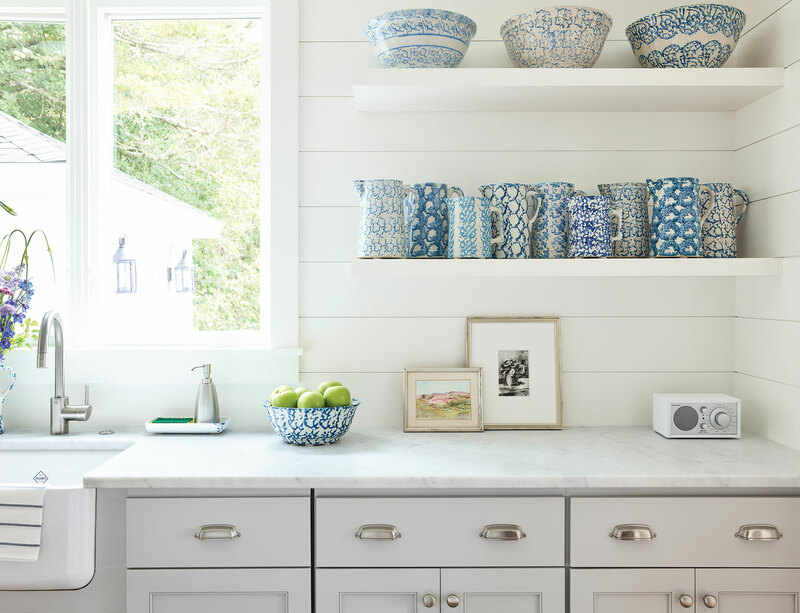 They added shiplap walls in the galley kitchen to visually widen the room and lend a nautical feel, and enlarged the water-facing windows in the living room. “We wanted to bring in more light, better airflow, and broader views of Castine Harbor,” Thai explains. Outside, they replaced old painted shingles with white clapboards for a simpler, cleaner look, and removed shutters that were crowding the house. 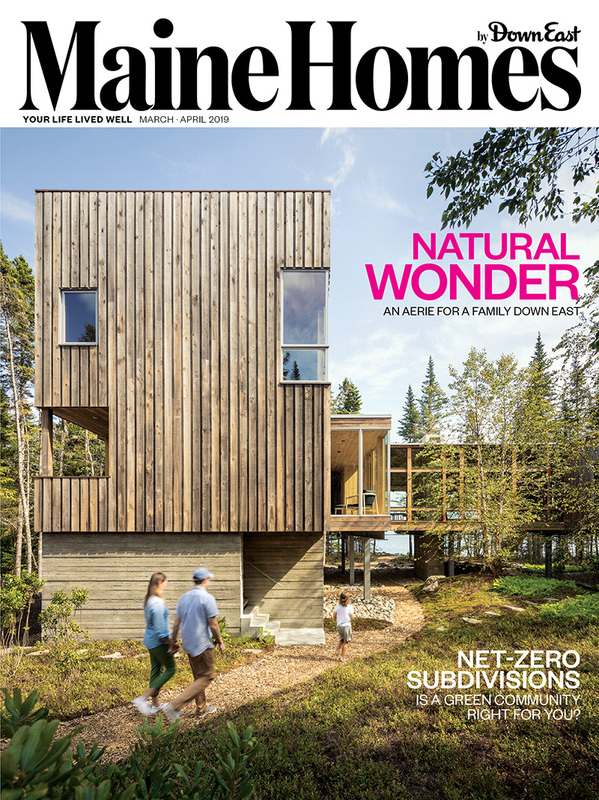 Thai saw so much potential in the cottage, and Troeschel “served as the implementer of his vision,” working closely with local suppliers and tradespeople, especially Orland builder Stan Leach, a restoration pro who helped execute every detail. With the construction done, Thai decorated with an eye toward keeping the rooms “comfortable, approachable, not precious,” incorporating slipcovered, wicker, and painted-wood furnishings from antiques and big-box stores. Palette-wise, “I wanted to bring in the colors of the surrounding area — whites, blues, grays, lighter woods,” he says. 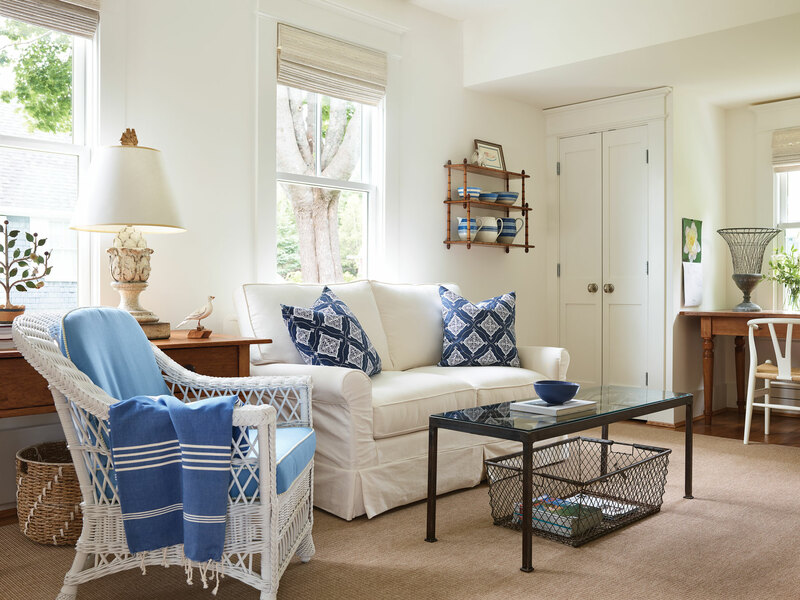 “I love blue, but as many blue days as Maine has, it’s also so pretty when it’s gray.” Imbuing a coastal home with matching hues helps root it in the natural setting, he adds, and makes it feel more spacious. The result is the ideal vacation spot. One that — like a long-distance sweetheart — the couple eagerly anticipates returning to. “We’re counting down the days to summer,” Thai says. ABOVE The living room’s vintage maritime scenes were fun to collect at local antiques markets. 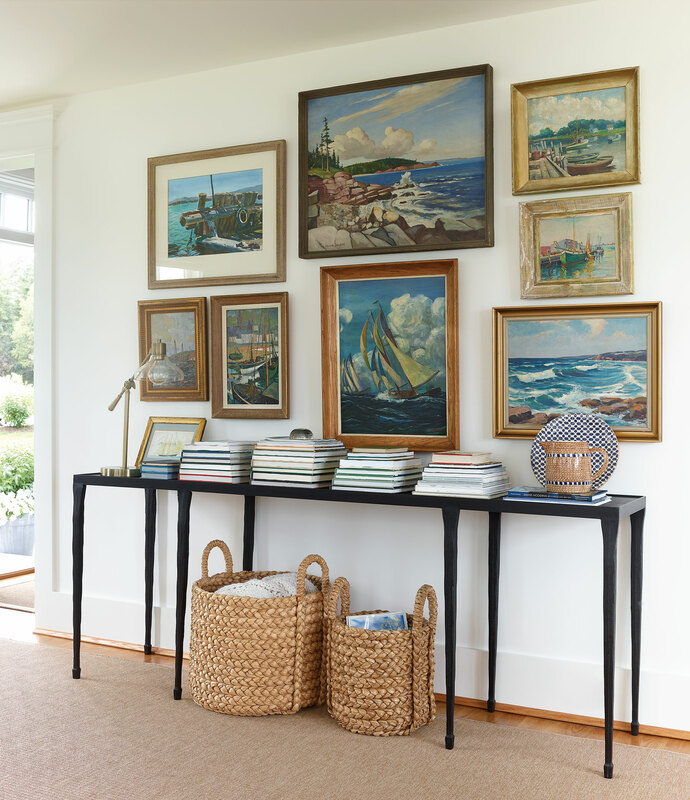 A slim Crate & Barrel console table (topped with a vintage-looking Target lamp and stacks of Maine-themed art and history books) anchors the display. Absolutely stunning! I also loved the comment about going to Castine. We too are from Maryland and our son attends MMA. Was the Victorian home sold, I bet that is a beauty. I’m a member of the family that owned this house until 2015. My wife and children and I had the opportunity to stop by Castine last summer, and Loi and Tom kindly showed us the house. 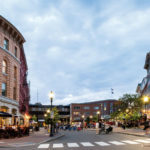 They did a great job, and we are thrilled they were able to renovate the existing structure, rather than tear it down, as it did need a lot of work. We miss the place terribly, but are glad to see it’s in good hands.